After a clear drive up with snow covered hills and a full moon, we arrived at the Grey Corrie Lodge Bunkhouse at Roybridge. 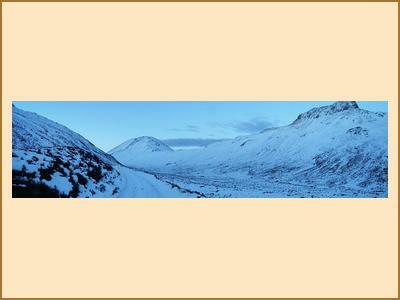 Claire H and Antti enjoyed a run up the Lairig Leacach to the bothy below Stob Ban in the late afternoon. Everyone got off to an early start on Saturday, with Fiona C and Emma heading up Carn Mor Dearg with lots of spin drift higher up. Ali G & Rebecca traversed around Aonach Mor from Glen Nevis to the Gondola, and Katrina and Clare A headed to the Grey Corries from Glen Nevis. Claire H, Antti and Philip climbed Carn Mor Dearg and carried on to Ben Nevis after getting a lucky break in the weather on the Carn Mor Dearg arete. Elsie and Adrian went climbing on the West Face of Aonach Mor and Daniel headed round to Glen Nevis. Allan, Alison F, Kate, Chris R and Jenny climbed the two Corbetts Cruach Innse and Sgurr Innse. Most of us headed to the pub next door in the evening for a meal and a few pints. Sunday brought clear blue skies and great views although it was very windy in places. 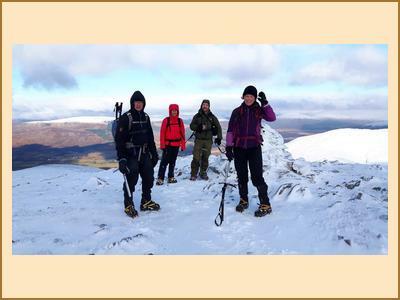 Alison F climbed the Sow of Atholl and Fiona C headed for Ben Vrackie on the way back home. Clare A, Katrina and Daniel climbed Sgairneach Mhor and Beinn Udlamain at Drumochter and Antti and Claire H had a successful ski tour up Carn na Caim near Dalwhinnie. Philip climbed a couple of the Mamores from Glen Nevis and Emma, Chris R and Kate climbed Beinn Chaorainn and Beinn Teallach to the north of Tulloch Station. Many thanks to everyone for their good company over the weekend and another great meet.